After reports circulated on social media about two iPhone 8 Plus exhibiting a swollen battery out of the millions shipped, Apple is reportedly looking into the situation surrounding the accounts and the phones themselves —as it nearly always does. 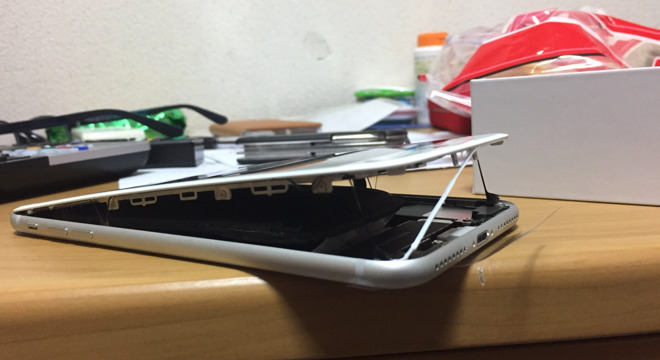 The two reports both clearly depict a swollen battery pushing the iPhone screen out of its housing. One user reported it happening while being charged claiming that an official cable and power adapter were being used, and the other account noted that it was received from Apple directly with the screen already popped out. According to The Independent, Apple is "looking into" the issue —a fact confirmed by AppleInsider on Saturday morning. But, a source within Apple not authorized to speak on behalf of the company informed us that Apple investigates swollen batteries even on older phones brought into Apple retail stores as a matter of course. A quick poll on Saturday morning of five Apple Genius Bars that we have worked with in the past show zero iPhone 8 or iPhone 8 Plus models brought in for service with a swollen battery such as that displayed in the pair of reports. Media, and the internet, are latching onto the story as an imminent problem, akin to the Samsung Galaxy Note 8. However, at this time, this appears to be nothing more than an "infant failure" of both devices, assuming the accounts given by the users are correct and complete. In 2016, prior to the Galaxy Note 7 debacle, the lithium ion battery immediate failure rate on the average was one in about one million cells without mishandling. So, at present, assuming that both failures were manufacturing defects and not from abuse in shipping or by the purchaser, the failure rate is still well within the statistical norm even assuming that there are more than 20 times the number of incidents. For reference, the reported failure rate on the Galaxy Note 7 exceeded 1 in 20,000 —and linked to both battery production problems, and a design problem with the phone.